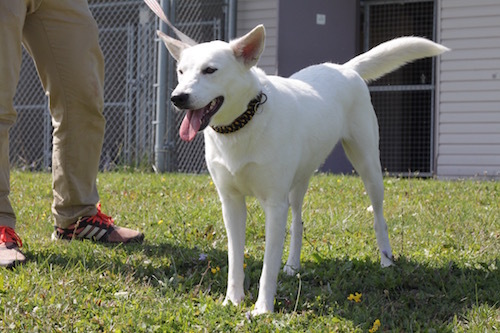 Marshmallow is a majestic lab/white shepherd mix who is new to Canada and ready to find her forever home! This beautiful white dog is 40 lbs and only two years old. She will do great with another dog of similar size in the home as she is friendly, playful and would make a great social companion. She loves people, mud, running, and playing. She’d do very well in an active home since she’s got lots of energy to burn.